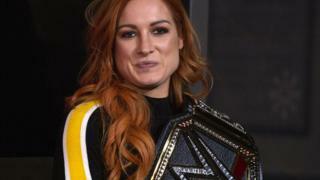 Becky Lynch won the headline Winner Takes All match at WrestleMania 35 at what was the first ever all-female main event in WWE's history.It means she's now both the Raw and Smackdown champion after beating defending title holders Ronda Rousey and Charlotte Flair.Ahead of her win the 32-year-old tweeted: "Today is the day when you and me change how this business works. "WWE's biggest show of the year has been described as a game-changer. During its 35-year history Wrestlemania's main event has seen the likes of The Rock, Hulk Hogan and The Undertaker fight it out for the WWE's top prize.Known as The Man, Becky - who is originally from Limerick in Ireland - has helped inspire a generation of female wrestlers. "For so long, the wrestling industry has seen women as second-class citizens," Rihannon Docherty, who wrestles as Rhia O'Reilly, told BBC Newsbeat.